Dana O’Shee is one of the lightest fragrances I own. A little doesn’t do it for this one simply because it’s so translucent. One look at the notes should tell you enough and make you wonder how a grain scent is supposed to be isolated. It’s not like milk and honey help much either. So when it comes down to it, Dana O’Shee requires slathering. In Bottle: Honeyed almonds. Very simple, quite the gourmand. It’s extremely simple though and I can’t help but draw the similarity between Dana O’Shee and the almond extract in my cupboard. When it all comes down to it, had Dana O’Shee not been bottled and labeled as perfume, I might have mistaken it for a baking ingredient. Applied: Upon application the almond fragrance starts to evaporate first and within a few moments that sweet almond extract fragrance is gone. What I’m left with is a flat, milky very slightly sweet scent. The middle stage of Dana O’Shee reminds of dusty kitchens and creamy milk. The simplicity is what helps it along. If I’m not expecting a complex garden of florals and incense, I can dig it. Dana O’Shee dries down to practically nothing within a few hours. Short lived, stays close to the skin, smells fabulously like almond extract at first then fades into creamy dust before disappearing. Extra: From Irish folklore, the Dana O’Shee are small, beautiful, eternal little creatures that kidnap people. Design: Presented in an amber bottle and a black twist cap with 5ml of perfume oil. Notes: Almond, milk, honey, grain. Upon visiting the kitchen and unscrewing the ol’ bottle of almond extract in my baking cupboard, I wasn’t too far off. Dana O’Shee’s almond is a touch more complex than the stuff I add to cookies but it bears an extremely close resemblance. 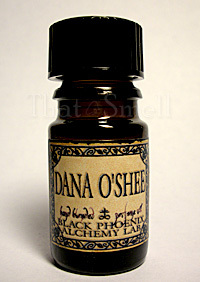 Reviewed in This Post: Dana O’Shee, 2009, 5ml Bottle. This entry was posted in black phoenix, gourmand, Reviews By House and tagged alchemy, almond, black, dana, extract, fragrance, honey, lab, milk, oshee, perfume, phoenix, shee. Bookmark the permalink.